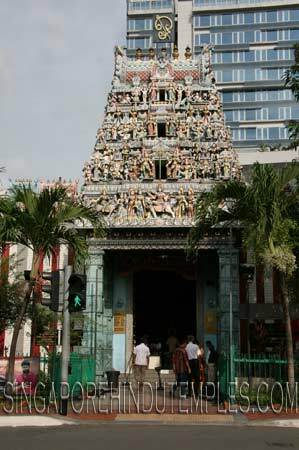 Sri Veeramakaliamman temple at 141 Serangoon Road is one of the oldest temples in Singapore. Built by Indian pioneers who came to work and live here the temple was the first in the Serangoon area and became a focus of early Indian social cultural activities there. The Serangoon Road already had began to evolve as a distinct Indian enclave under the British Colonial government . The British administration outlined settlement patterns along ethnic lines and for the Indians this marked the beginning of the development of the Serangoon Road area as an Indian sector. As the migrant population grew , " Singapore's Little India" began to attract more Indians from the nearby Market Street and Chulia Street areas. Many of these early Indian settlers in the Serangoon Road area were involved in cattle - related activities. As the Indian in the area became more established they were able to help newcomers to settle in the area , and so Serangoon Road began to flourish . The cattle trade led to many related business ventures in the area. The cattle, for instance, were used to operate machines to grind wheat and press sesame oil. Pineapple preserving factories were also, well situated in the area as the pineapple skins could be used to feed the cattle. Roads and buildings were built by workers from the nearby municipal labour lines. There was also a convict goal at the junction of Bras Basah and Bencoleen Street and Indians engaged in prison related service and supply activities were also drawn into the Serangoon area. And as the Indian enclave developed more services became available. Hawkers selling food and wares, for instance, emerged to cater to the growing population there . Around the middle of the 19th century, there were some 13,000 Indians in Singapore , many of whom must have been in or near the Serangoon area. It is not surprising, therefore, that the need for a place of worship in the area arose. Therefore , the Sri Veeramakaliamman Temple was built to cater for hundreds of Indians who had come to live in a foreign land. Having a temple in their midst must have helped these pioneers feel more at home as it provided an important avenue for them to recreate in Singapore what they had been familiar within their country of origin. The choice of Sri Veeramakaliamman as the chief deity of the temple is significant. Referred as a powerful goddess and Destroyer of Evil, her presence answered an important need of the early migrants - the need to feel secure in a new land. It seems that in the early days worship at the temple began at a small shrine with carvings and inscriptions. From these beginnings the temple was gradually built. According to one account, Hindu residents in the area helped to build the temple. According to a 1969 report by J.P.Milaret , Bengali workers were involved in the building of the early temple structures. However, there are no temple records which confirm this report. From the temple's earliest days it was associated with the Indian workers. In the old days the temple came to be known as the "Soonambu Kambam Kovil", that is, temple at the lime village. This was because many Indians who attended the temple worked in lime kilns in the area. (Lime formed part of the mixture that was used for buildings in those days). Many of the devotees were daily-rated workers of the Singapore Municipality. By the end of the 19th century there was daily worship and regular religious functions held at the temple. As the Indian population continued to grow, the temple was increasingly the focus of religious,social and other cultural activities. Initially there was a part-time 'pujari' to officiate at the temple. By the turn of the century, the amount collected from temple services and charity-box collections made it possible to engage a full-time priest. According to some oral history accounts , one of the first shrines at the temple was centered around a clay statue of an angry Sri Kaliamman, triumphant over evil . Over the years more shrines and rooms were added and the temple expanded. In 1908 a statue of the goddess was ordered from India for the deities' central shrine in the temple. In the same year a shrine of the goddess Sri Periyachi Amman was also built. Some nine years later shrines of Lord Ganesh and Lord Subramaniyam were established . In 1938 a chariot was bought. A large hall was added to the temple in 1953.Through the years the temple became more established. During the second world war when there were air raids, many took refuge in the temple and were safe there . The temple and those within escaped the bombings unscathed. The rebuilding of this historic monument began in October 1983. In the middle of August 1986 workmen came across several pieces of the temple's old statues while digging in the what used to be the temple compound. According to the temple authorities these may be locally made statues which were at the temple before the more finely made ones from India began to arrive. At a cost of 2.2 million the new temple with its distinctive Gate-Tower, eight main Domes and several other minor ones, has taken three years to be built.